Pattern Base Management Systems (PBMS) have been introduced as an effective way to manage the high volume of patterns available nowadays. PBMS provide pattern management functionality in the same way where a Database Management System provides data management functionality. However, not all the extracted patterns are interesting; some are trivial and insignificant because they do not make sense according to the domain knowledge. Thus, in order to automate the pattern evaluation process, we need to incorporate the domain knowledge in it. 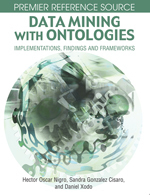 We propose the integration of PBMS and Ontologies as a solution to the need of many scientific fields for efficient extraction of useful information from large databases and the exploitation of knowledge. In this chapter, we describe the potentiality of this integration and the issues that should be considered introducing an XML-based PBMS. We use a case study of data mining over scientific (seismological) data to illustrate the proposed PBMS and ontology integrated environment.